Travel journaling is a powerful (and fun) way to dive deeper into your destination, memorialize your journey, discover yourself, and find direction in life, beyond your travels. Journaling can also spark your curiosity, a trait that cultivates open-mindedness, adventure, understanding, and makes life more passionate and interesting. And as you may have heard, people who ask better questions get better answers. So bring on the curiosity! What better way to cultivate your curiosity than while traveling? These travel journal prompts will get you started. All you need is a notebook, a pen, and a cozy spot (preferably with good people watching). Coffee or wine optional but highly encouraged. Get the ultimate guide to travel journaling here. Find out why your vacation journal can make you happier. Learn how to cultivate more meaningful travel experiences. Think about the most passionate person you’ve come across. What makes them shine? Describe a pattern, color, or style unique to the area and find out how it originated. Write a step-by-step detail of your day through the perspective of a two-year-old child. Describe your favorite local dish. What’s its cultural background? Why do people love it? How do you feel right now? Write down the environmental signals that make you feel this way. What makes someone catch your attention? Have your destination expectations met reality so far, why or why not? Describe your surroundings in detail. What questions come up? Are there any political or cultural hot topics happening now? How are people reacting? Rewrite your day from a local’s perspective. What personal and cultural habits are different from yours and how? Let yourself get lost, then write about the most surprising part of your day. Try a new-to-you food and describe it using all five senses. Pick out the most interesting person nearby and imagine what their day is like. Think of a local word or phrase and find out its origins. What would your ideal daily routine be if you lived here? Describe a scent that will always remind you of your destination and why. Do you feel more or less like yourself here and why? Want more travel journal prompts for self-discovery? 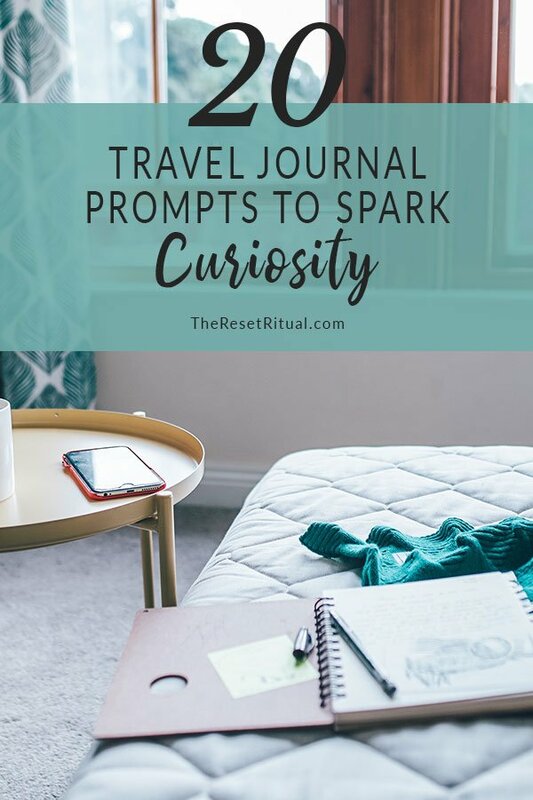 Scroll down to get your free travel journal prompts printable below.